This is great. I never would have heard of Spondon Village, Derbyshire, had I not been surfing around CommmunityWalk tonight. You really have to check out this fantastic map, complete with so many pictures of this town. It's really amazing how much of a difference the photos make sometimes! This really makes me want to go and visit Spondon Village! New! Full Featured CommunityWalk Maps For Your Own Site! In an effort to provide people with fully functional maps that they can take with them to their own websites, we've put together another code snippet that is accessible from your "My Communities" page that provides a fully funtional maps, tabs and all, that you can drop into your own website. You can customize the height and the width and set the color to match your websites color! For an example of how it works check out this little demo I put together. 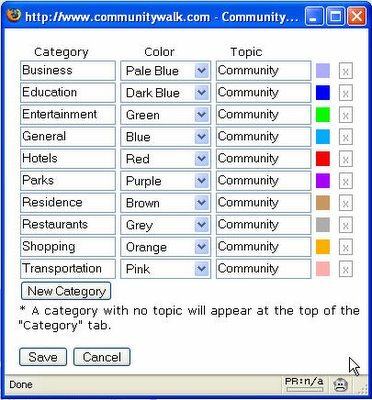 Simply enter a hex value for a color (000 = black, FFF = white, 0000FF = blue), click "Change Color" , and watch the CommunityWalk map blend in seamlessly with the new background color. Click here to check out the demo. If you have any feedback on this feature I would love to hear it. 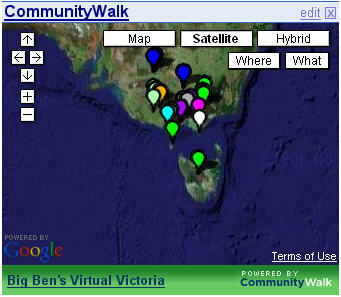 We are considering offering a version of CommunityWalk like this without the ads for a monthly fee. It would help us a great deal to decide if we get good or bad feedback about this free version. We've been so busy making the performance and stability of CommunityWalk better over the past few weeks that there has not been much time left over for enhancements and features to the site. So we did up a small release which fixed up a number of bugs and introduced two small but important usability enhancements. 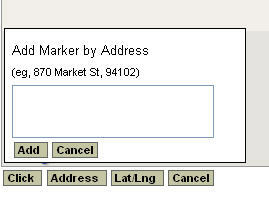 The first simply makes it easier to enter in address information by providing a larger area to work with. You can now easily take an address from any website, copy it, and paste it right into the text area shown in the picture below. The second makes is easier to edit the categories for your map while you are creating or editing a location rather than having to go to the "My Communities" page. Now you can simply click the link "Edit Categories" just below the "Subcategory" field in the infowindow popup as shown below. Then a window will pop open that provides access to the map's categories. You can add and delete them, rename them, and change their color* without ever leaving the map page. Clicking save will let you use any new categories you've added on the location you are creating or editing. Once you save the location all of the color changes will be made as well. Well it took some time, but I think we've finally got CommunityWalk performing well across the board. There were a number of issues we needed to deal with, but they have now been addressed and, if I do say so myself, it is quite snappy now! The biggest impact was on IE where a large map with many different categories was loading quite slowly. Now it only takes a few seconds to load even the largest maps (on a standard DSL connection). We're not stopping here, either. Performance is of the highest priority. Hot on the heels of the enhanced mini map iframe functionality (See Previous Post), I whipped up a little Google Home Page module that lets you include any map from CommunityWalk on your Google Home Page. Here is an screen shot of my Google Home Page where I included one of my favorite maps, Big Ben's Virtual Victoria. And there you have it. 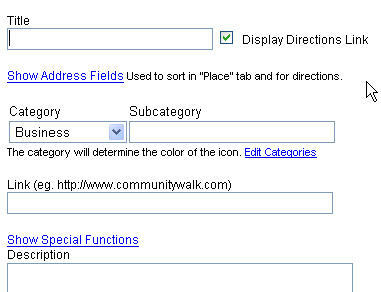 Your personalized CommunityWalk map on your personalized Google Home Page. Another very interesting map just caught my eye. This one highlights a whole slew of maze type structures (looks like most of them are hedges carved into mazes) that are visible using the satellite imagery of Google Maps. As soon as you get to the map (click on a location or the map title below) just click on the highest zoom level (most zoomed in). Then use the panel on the right hand side of the screen to navigate between the various mazes. I have to say my favorite is Oprah! We just rolled out another performance enhancement. This one eliminates the streaming effect that used to be displayed in the top left corner of the screen when a map loaded. We found that we could speed up the loading of individual locations enough to make the streaming unneccessary. This simplifies everything a great deal and makes it so that the maps load much faster. If you find any bugs with this, though, please report them. We tested it a great deal, but it was a significant change and so it is hard to guarantee it will be bug free. Now that CommunityWalk has a logo and a design around it I wanted to update the iframe content we provide that lets you include your map on your own site. I've added the name of the map and the CommunityWalk logo to the bottom of the iframe and made it so that each location displays the location title, a snippet of the description and direct links to photos, direction, or comments if any of them exist for that location! Check out this example of the first map I ever created on CommunityWalk! Notice that if you zoom in on the map, change the map type, and then click on a photo link for a location you will be taken to the full map with the same zoom level and map type displayed with the photos for that location showing! Note: As with much of the CommunityWalk site right now there are still a few kinks with the iframe functionality on Safari. We are working hard to resolve these issues, though, and should have them done soon. You can get the code for your own map by clicking "Edit Settings" from your "My Maps" page. Just click on the "Put This Community On Your Own Website" section. You can also use the instructions under "Show Customization Instructions" to customize the way it looks and acts. The other day I recieved an email from a user who found himself looking at a map where half of the locations were editable and half were not. When the user switched to Firefox it worked fine. I had no idea what was causing this until I sat down last night and did some serious investigation. Well it turns out that Internet Explorer was saving the user's last view of the map. So a number of the locations were saved in "View" mode. When the user created a few new locations these were saved in "Edit" mode, creating the discrepancy. My apologies to anyone who was left confused by this bug. If you see anything like this in the future do not hesitate to contact me. It has been a while since I used this blog to point out any maps that have been created on CommunityWalk. There have simply been too many for me to keep track of. 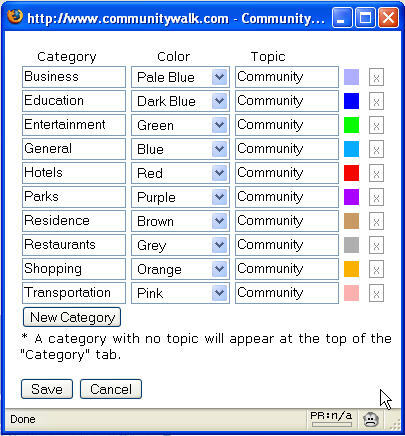 One need just explore the first few pages of the popular tab on the CommunityWalk frontpage to see some maps that were created with great care. I'd like to take a second, though, to point out two maps that caught my eye today. They are being built as I speak, so they don't have the numbers to make it onto the popular tab, but they have clearly been created with great care. The first, Community 1372, caught my eye because of the level of organization that went into it. It maps out a city with great detail. It's really quite impressive. The second, titled "San Antonio", has a much more free flow to it. It captures the city of San Antonio through photos, something done on a number of the more popular maps like StreetPhoto. I've always liked this approach as it really brings to life a completely unique perspective on a place that so many people know and love, allowing people to see it in a completely different light. I think these two maps simply impressed me with their distinctiveness and the fact that they really made me want to visit their respective areas, but for completely different reasons. I only hope that CommunityWalk will continue to develop and grow until it has many more maps like these. Once the Explore functionality is complete it will be much easier to find maps like these about your favorite part of the world. Personally I can't wait! Well it turns out there were a number of bugs left around despite all of our efforts. The most obvious of which was that comments were not working. If someone tried to leave a comment on a location on a map then the commment would be saved without any information. We fixed the bug and released it, so everything should be fine now. Unfortunately there were quite a few comments left that were blank, so we went ahead and removed these from the database. My apologies to anyone who wanted such a comment around. CommunityWalk should be far more stable now, going forward. There are still some issues on Safari that we are going to be addressing right away, but overall the application seems to be running quite well!